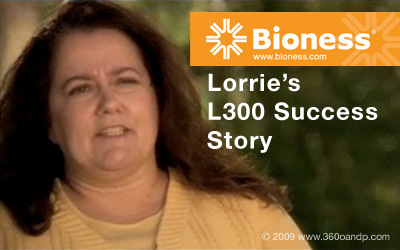 Lorrie is a wife, mother, and grandmother who has Multiple Sclerosis. "[My niece and nephew] would come to the house and they would want to go outside and play or go for a walk or something—my husband would take them. It was just too fatiguing for me to even think about doing that." [The AFO] helped prevent some of the falls, but I can remember opening the front door, going to step out, and just swinging out the door and landing in the bushes instead. Then it wasn’t fitting right because of atrophy." "The L300, I saw it in a magazine, I went to the doctor and I said, ‘This is what I want.’ I had a normal appointment to go in for a checkup and I said to [the doctor], ‘This is the device that I had talked to you about that I had wanted.’ And I started to explaining it to her and showing her how it worked. Well she got so excited." "The L300 has changed my life. My husband says he can walk with me now. Before, he was walking six feet ahead of me. Now we can walk together, whether it be in the mall, whether it be just outside taking a walk. You don’t have the fatigue from swinging the leg."